Large jungle gym area can take 40-60 people and is especialy suitbale for coprporte functions. There is a braai facility available on request. 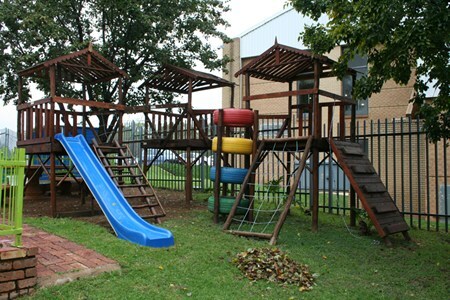 Jungle Gym for children 6-10 years. This is a separate area where one party per session can take place. Jungle Gym with swings. From this venue they can also play putt putt and make use of the trampolines and the board games. Tables and chairs with colour table cloths of your choice along with balloons are prepared. You are allowed to bring your own cake, cold drinks, party packages, snacks etc. Putt Putt at R35 per person unlimited. This is a large party area and we can accomodate 40 - 60 people. Accoring to the amount of kids the same amount of adults is allowed and thereafter R20 per person.